Good & Twisted YogaGood & Twisted Yoga | Yoga studio and classes in Chaska MN. Fitness, prenatal and kids classes. Voted BEST YOGA STUDIO in the Southwest Metro 2018! Discover your true potential with us! Kick-off meeting Fri 4/19 6pm. Cleanse begins 4/29! • Forget your mat? Rent one of ours ($2)! New students receive their first month of unlimited yoga classes for only $65! Please enroll in your first class online, or arrive 15 minutes early for your first class to get registered! Studio doors are open 20 minutes before and 1/2 hour after each scheduled class, and by appointment. Our goal is to bring balance and wellness through yoga to the Southwest Minneapolis area including: Chaska, Carver, Victoria, Jordan, Shakopee, Chanhassen, Excelsior, Eden Prairie, Belle Plaine, Waconia, Wayzata and Minnetonka. We are always interested in meeting passionate, fun, certified yoga instructors! Please see the Instructors page to apply (click the “Want to Teach with Us?” icon)! 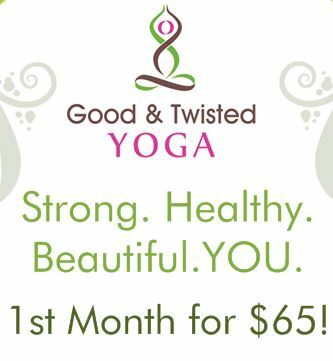 We would like to personally welcome you to Good & Twisted Yoga (GTY)! My name is Jennifer (JJ) Fahler, and my yoga journey began when I was teaching group fitness classes at a local health club 20 years ago. A fellow instructor was going to a yoga training class and asked if I’d like to check it out. I had no idea what yoga even was, but I’m always up for learning something new and interesting, so I went. Little did I know I would be hooked for life! I continued on my path with yoga trainings and a diligent home practice, and began teaching yoga a couple of years later at health clubs, yoga studios, my home and corporate settings. This continued even after having two children and managing a demanding corporate career; I reserved time to teach because of the fulfillment and genuine satisfaction I received from it. After many years of ‘wouldn’t it be great if…’ I am thrilled to have realized my dream of opening the Good & Twisted Yoga studio. We are delighted to bring a yoga studio committed to overall balance and wellness to our community. GTY offers a variety of class formats and trainings including heated Vinyasa flow yoga, yoga for flexibility, heated Hatha yoga, kids’ yoga, prenatal yoga, and yoga teacher training to name just a few. We design our classes to provide you with opportunities to slow down, build strength, increase flexibility and be in the present to discover a life of wellness and balance. Yoga practice will become a way of life that follows you off your mat and into your world. We want you to know you already possess everything you require to live your most vital and meaningful life… yoga provides the tools and mindset that will help you accomplish that.